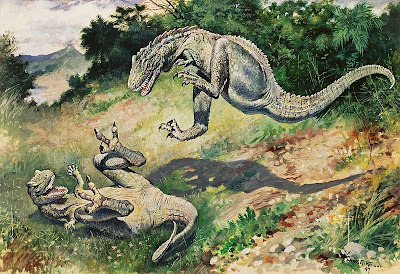 My illustration of the tyrannosaurid Teratophoneus taking down a Gryposaurus appears in the issue of Scientific American that's on the newsstands now. One of the inspirations for the painting was this 1897 painting of Laelaps by Charles Knight (1874-1953). Knight was one of the founding figures of paleoart, working more than a century ago. He started out by drawing living animals at the zoo, then studied animal anatomy and worked at the American Museum of Natural History. Despite obstacles like vision problems, he went on to paint many murals and illustrations reconstructing extinct life forms. His work has influenced several generations of artists and filmmakers throughout the 20th century. An excellent new coffee table book on Knight by author and anthropologist Richard Milner has just been released. It tells his life story, shows a lot of his drawings, and explains how he developed his remarkable vision of extinct life. I know that painting well. 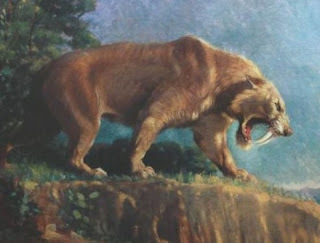 It is permanently ingrained on my mind from my dinosaur books that I owned as a child. This link has several page scans, with a young Knight appearing on page 11. We see him go through the process of creating his own research to in order to understand dinosaurs as living animals, visiting reptile experts, zoos and paleotologists. There's a sequence showing him painting this very picture, using models he made himself. His New Year card is very Dinotopian. Oh wow, for his time, painting therapods active and fighting like that was revolutionary. The Field Museum in Chicago has a bunch of mural size paintings by Charles R. Knight in their evolution wing. It's one of my favorite destinations when I'm visiting the museum. One of the coolest depicts a Megaloceros on a hilltop. Reminds me of your own Irish Elk painting, James. Knight's dinosaur paintings were among the first things I tried to copy as a 7 or 8 year old budding artist. They are still among my favorite depictions of dinosaurs- anatomical flaws and all. Charles Knight is definitely one of my artistic inspirations. 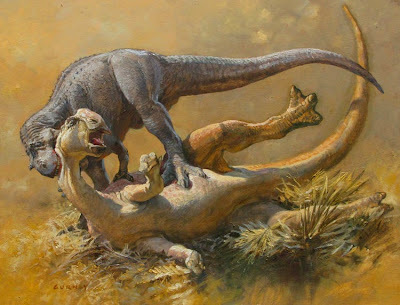 Not only was his work all over the dinosaur books and multimedia I owned as a child, but now as a student I admire his attention to anatomically accurate reconstruction, and his willingness to think outside of the box of contemporary conventional paleontology to portray his extinct subjects with a kind of dynamism that few others before him had dared to. Kessie: from my understanding it wasn't that unusual at that time. 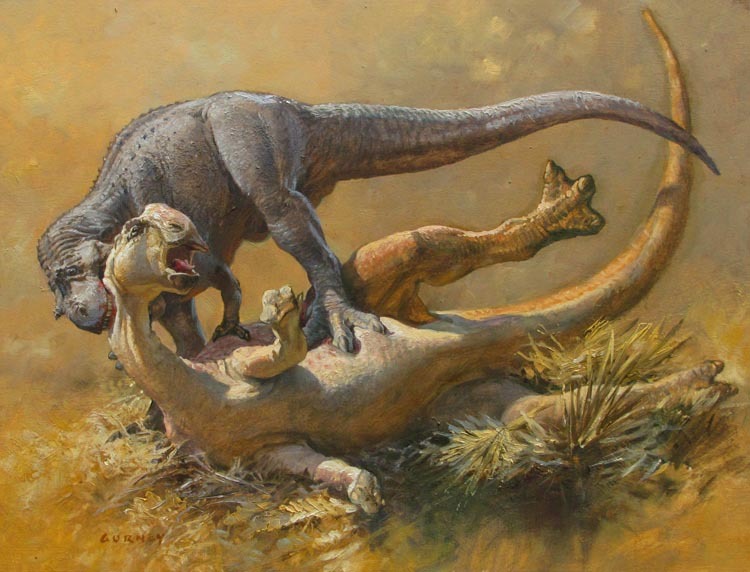 Progressive, yes, but IIRC not too controversial until dinosaur palaeontology took a big step back in the early-mid 20thC - to the grey tail-dragging cold-bloods we all know and loathe. I need to find somewhere that sells SA over here. Not easy to stumble across. I just bought that copy of Scientific American and thought 'Gee...this style looks familiar' Shoulda known that it was yours. They have a great exhibit of a lot of his watercolor paintings at the Los Angeles Museum of Natural History, in a room above the main floor of the dinosaur room. It's awesome to see them!